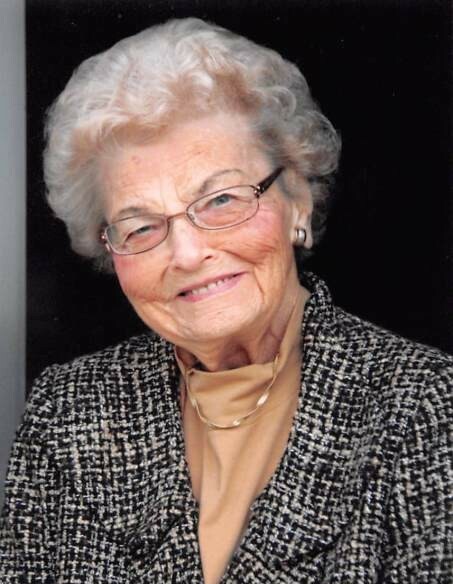 Vivian Johnson, age 91, passed away Monday, May 14, 2018 at her home in Wendell, MN. Vivian Eileen was born on October 19, 1926, in Elbow Lake Township, the daughter of Iver A. and Hattie (Pikop) Olson. She attended rural District #39 School in South West Elbow Lake Township graduating in 1940 from the eighth grade. Following school, she stayed home to care for her ill mother and help on the family farm. Vivian helped with many of the daily chores on the farm, driving her dad’s tractors, plowing, rounding up the cattle with the F20, as well as helping babysit the neighbor children. On December 4, 1945, she married Marcus (Marky) Johnson in Fergus Falls, Minnesota. The couple were the parents of 16 children. They lived in Wendell and on area farms in Stony Brook Township before moving to the Johnson family Farm which has persevered for three generations. She helped Marcus with the daily tasks on the farm as needed while also tending to their very large family. Marcus passed away in December of 1994. Vivian stayed on the family farm until fall of 2004, when she moved in November to her current place in town, but still enjoyed the usual trips to the farm to reminisce. She was a member of Trinity Lutheran Church where she taught Sunday School; active in Trinity Ladies Aid, where she was a quilt maker; member of Wendell Legion Auxiliary, serving as a past President as Flag Bearer. Vivian enjoyed crossword puzzles, reading, collecting dolls, coloring books, bird watching, planting her gardens and was self taught on the piano where her talent thrived playing by ear. She enjoyed baking and was rarely seen without her trusty apron, baking up one of her Norwegian delicacies, cookies and bars. Vivian enjoyed watching Little House on The Prairie, Gunsmoke, Rifleman, Game Shows, and listening to music, particularly Willie Nelson. She cherished spending time with her siblings, family, attending her grandkids extracurricular events and going to parades especially the ones that had horses. She had a deep love for her dogs, Barney, Nikki Poo, and especially her black lab Indy (Lou). Vivian was very proud of her ability to walk and drive her vehicle right up until her passing. Looked forward to the days she could run errands in Fergus Falls or Elbow Lake. And of course, a little shopping. She remembered all birthdays, anniversaries and enjoyed sending cards, making sure not to miss anyone. She had a contagious sense of humor that will be missed by all who knew her, and as her dialysis gals would say, "she was a spry lady." She is survived by her 14 children, Carol (Orlin) Ladwig of Sauk Centre, Michael Johnson of Elbow Lake, Jeffrey (Darla) Johnson of Wendell, Darlene Roberts of Hutchinson, James (Cindy) Johnson of Norfolk, VA, Eileen (Kenneth) Langner of Alexandria, Steven Johnson of Wendell, Dell Ray Johnson of Wendell, Clay Johnson of Alberta, Ricky (Brenda) Johnson of Alexandria, Daryl (Michelle) Johnson of Lakeville, Dean (Lori) Johnson of Fergus Falls, Sandra (Lowell) Dunn of Herman and Shawn (Phyllis) Johnson of Alexandria; 25 grandchildren; 14 great grandchildren; a sister-in-law, Dolores Johnson of Fergus Falls along with numerous nieces, nephews, family and friends. She was preceded in death by her husband, Marcus; daughter, JuLayne; son, Terry; son in law Francis Roberts; Great Grandson Benjamin; sisters, Pearl (Louis) Stephens, Deloris (Leland) Derby; Infant sister, Fern; brothers, Vernon (Alice) Olson, Glenn (Murlene) Olson, Willard (Kay) Olson, and brother-in-law, Paul Johnson. Visitation: 2:00 – 4:00 PM Sunday, May 20 at Erickson-Smith Funeral Home, Elbow Lake with a Prayer Service at 3:30PM. Visitation will resume one hour prior to the service at the church. Following the service, lunch will be served at the Wendell Community Center.